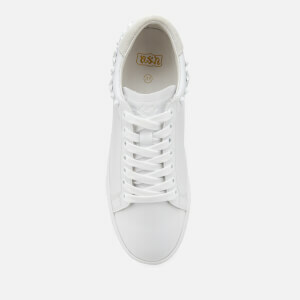 Women's low top trainers from Ash. Crafted from smooth leather to create a sleek upper, the 'Dazed' tennis shoes feature a rounded toe, classic lace-up fastening and tonal stud detailing at the heel, in the form of stars and coned studs. Complete with off-white suede panel to the padded collar and ventilation eyelets to the inside and outside foot for breathability. Set upon a durable rubber sole with red star motif. Branding to the tongue.